Tablets can be great educational tools and, of course, entertainment devices for kids. They can also be great for staying in touch with relatives who live far away! My little nephew regularly Skypes with family in Argentina, Connecticut, North Carolina, and Rhode Island on my sister’s iPad. As his 2nd birthday approaches, I was thinking how, in only a couple years, my sister and brother-in-law will most likely be considering which tablet will be appropriate for him to use on his own. I started researching Amazon’s best-selling lists and websites like PCMAG.com and Consumer Reports to see what the best options are and compiled a list of the best-selling and best-reviewed tablets for children. 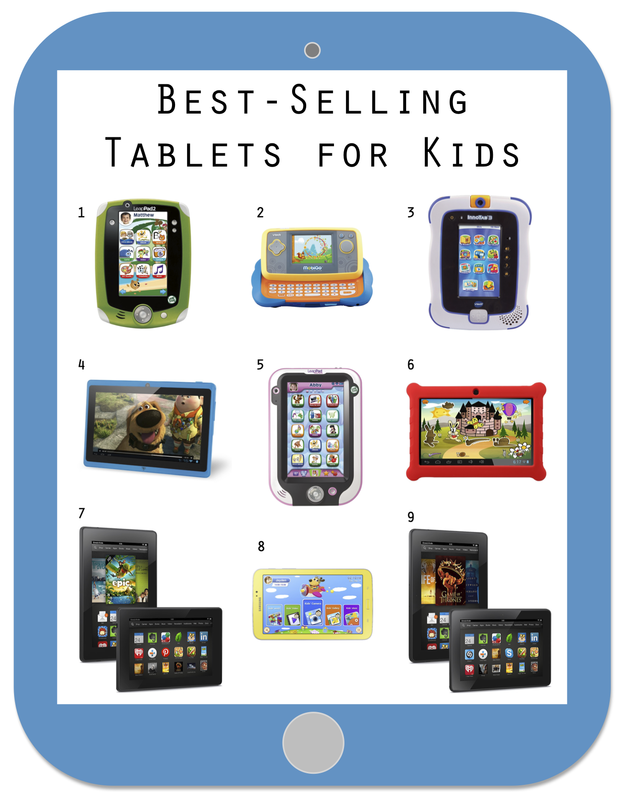 Not all supposedly “best-selling tablets” make great devices for children. For example, the iPad Mini is on many “tablets for kids” lists because of its small size but doesn’t seem like the best decision to me. With a price tag of over $300, dropping this tablet could be an expensive lesson to learn not to mention there are limited parental controls on this device. Another example is the Fuhu NABI , a tablet designed just for kids that seems perfect on the surface, but when you look further, its reviews tell a much different story. On Amazon alone, there are 414 customer reviews. Out of that number, 149 are 5 star reviews and an astounding 134 are 1 star reviews! One reviewer writes: “Zero customer support. Awful functionality. There is no way in the world I would EVER purchase another one. I can’t say enough negative about it.” Yikes! So…on to the good stuff. Here are 9 kid-friendly tablets with links for you to check them out for yourselves on Amazon. WHAT TO KNOW: This tablet is designed specifically for kids ages 3-9. It has front and back cameras, can record videos, and comes with 5 apps included. Kids can learn about reading, art, music, language and culture, science, geography, mathematics, health and more on this device! WHAT TO KNOW: The InnoTab 3 is more compact and lightweight than its predecessors, making it a perfect choice for little hands. The tablet, designed for kids 3-9, comes equipped with 15 apps (more available for purchase), an interactive e-reader, and a camera with over 55 special effects! WHAT TO KNOW: If you’re looking for an inexpensive tablet for an older child who may have already outgrown her “kids” device, this could be the one for you. Several reviewers on Amazon raved about it for their tweens, but please make sure to supervise- this tablet doesn’t have parental control settings. Tablet comes pre loaded with Google Play Store, Chrome, Netflix, Skype and other important apps. WHAT TO KNOW: This tablet is designed for children ages 4-9 and is, in their own words, “durable and drop-tested”! It comes with 11 pre-installed apps and works with LeapFrog’s library of 800+ apps, games, eBooks, videos, music and more. The device has front and back cameras, a 9 hour-rechargable battery, and, unlike the LeapPad 2, this device can connect via Wi-Fi to kid-friendly sites! WHAT TO KNOW: I love that this tablet has a bumper making it safe to drop! It comes with pre-installed educational apps for child to learn letters, words, numbers and has parental control settings to set time limits, manage content, and apps. WHAT TO KNOW: This tablet has so many things to love: a drop and spill-proof case; pre-loaded kids apps with more available through Samsung’s Kids’ Store; parental controls for managing access and time-limits; and a “standard mode” setting that offers features of regular Galaxy Tab 3 for adults! WHAT TO KNOW: The Kindle Fire HDX has all the fantastic parental control settings and educational content as the Kindle Fire HD with several key differences that make it, in my opinion, the ultimate sharing tablet for parents and kids. A few differences: the HDX has a camera, 4G model available, and the new “Mayday” button to help you with anything you need. Since the price tag for this model is around $200, make sure to purchase a durable cover to protect your device like the Kiddie Case by Fintie that is shock-proof and has a handle!